This is a story of a dental treatment that spanned over 6 months by combining Invisalign treatment with In-Office composite Veneers and brought tears of happiness to my patients' face. My patient, a young successful football player, was unhappy with his smile for many years and wanted to have veneers done to improve his appearance. 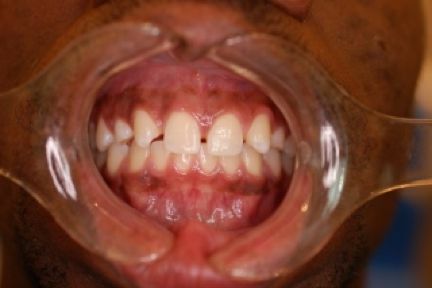 The case was a big challenge because he is congenitally missing the lateral incisors, the permanent canines are positioned in the lateral incisors place and his baby canines are still present in place where the permanent canines are supposed to be located. His teeth are also very small compared to the size of his jaws so there are large spaces present between his front teeth. If he would have had veneers done, his new teeth would have looked very wide and the result of the treatment would have made his smile look worse. In order to have the best result possible with minimal tooth destruction, after considering many treatment options, we have decided to have the treatment done in 2 stages. First stage would involve Invisalign treatment in order to reduce interdental spaces and the second stage would consist of veneers to get the final result. After the first stage the spaces between his front teeth were almost completely closed. My patient was already happy with the result and his improved smile. At the final Invisalign appointment the second stage of the treatment was done: all the attachments needed for Invisalign treatment were removed; four composite veneers were done in the office on his two permanent canines and on the two baby canines. With the veneers, the baby canines were transformed in permanent canines and the permanent canines were transformed in lateral incisors. This is a minimally invasive type of treatment, no tooth structure was removed and the composite veneers are reversible. 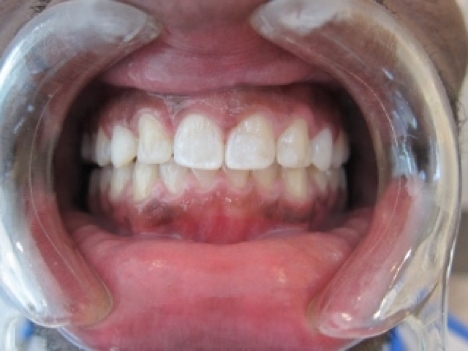 At the end of the second stage, my patient saw his teeth in the mirror and he was absolutely stunned with the results. For more information about this or similar cases or about any dental concern, contact our dental practice Gateway Dental Clinic, located in Toronto. Our goal is to provide excellence in dental care! At Gateway Dental Clinic we're focused on your well-being and are committed to provide the best customized dental care in a welcoming, professional and comfortable setting.